SAN FRANCISCO, CA--(Marketwired - Mar 30, 2017) - DroneDeploy, the leading cloud software platform for commercial drones revealed its third Commercial Drone Industry Trends Report, representing analysis of more than 10 million acres mapped by drone users in more than 160 countries across all seven continents. The original report, released a year ago, provided the first insight into global trends in commercial drone use based on real-world mapping data. The new report underscores the tremendous growth in commercial drone adoption over the last year and explores trends in drone hardware, the economic impact of drone mapping and usage of drone data across industries. Whether monitoring construction progress, scouting for crop damage or assessing insurance claims, drone mapping is becoming an integral part of the workflow -- 60 percent of DroneDeploy users create drone maps at least once a week. "More businesses are adopting drones to capture data across industries such as agriculture, construction, surveying, mining, and more," said DroneDeploy CEO Mike Winn. "It's clear that as our users experience greater productivity and ROI, they -- in turn -- are increasing the frequency of drone mapping and further integrating drone data into day-to-day business operations." Over the last twelve months, news of launches, fundraising, and flops by drone hardware companies has filled the headlines, but DroneDeploy's data shows what is actually happening in the market. The vast majority (97%) of drone mapping is being performed using multi-rotor drones, rather than fixed wing drones. Although newer drone hardware providers like Autel and Yuneec have entered the space, none of them seem to have made significant inroads against industry frontrunner DJI. Despite the large number of companies offering high-end "enterprise" drones, relatively inexpensive DJI Phantom and Mavic drones account for nearly 80% of all mapping by DroneDeploy users. Within this segment, DJI has maintained a rapid pace of innovation. Only five months after launch, the DJI Phantom 4 dethroned the DJI Phantom 3 Pro as the most commonly used drone for mapping, and as of mid-March, the Mavic and Phantom 4 Pro were racing neck and neck as they take aim to replace the Phantom 4. Approximately 20 percent of DroneDeploy users have mapped with multiple drones or sensors -- a 12% increase YoY -- as they attempt to keep equipment current amid the flurry of new releases from DJI and others. The report suggests that drone mapping has driven job creation worldwide, having contributed an estimated $150 million in economic value over 10 million acres mapped. Contributing to this uptick has been the major influx of new commercial drone pilots (29,000) since August when the FAA passed the Part 107 rule making it easier for drone pilots to operate commercially. While some of these newly minted pilots are hired in-house by companies within the industries they serve, many are starting new drone service businesses as they attempt to cash in on the new market opportunity. In fact, self-identified drone service providers make up the largest industry among drone mappers, followed by agriculture, surveying and construction. These drone service providers play a leading role as drone technology experts and advocates, and introduce larger companies to the benefits of drone mapping. "Even though we got great ROI from the photos, we saw that there had to be a better way. This is where DroneDeploy came into play -- now we can process maps and pull all of this data together in one program to measure distances and not have to scale manually," said Jesse Arenivas, Virtual Design & Construction Specialist, Rogers-O'Brien Construction. The added value of drone mapping over photo and video translates to greater revenue for commercial drone pilots that offer these services. On average, commercial drone pilots who offer drone-based mapping, 3D modeling and analytics are able to charge 16 percent more per hour compared to other providers that do not. An important development in unlocking the power of drone-captured data is the industry's only third-party App Market, a growing suite of over 30 specialized applications that can be installed right within the DroneDeploy user interface. Thirty-five percent of active DroneDeploy users have now installed apps from the App Market, representing more than 22,000 total app installs and growing, since the launch of the App Market last November. Tools available on the App Market range from easy-to-use integrations to popular Autodesk, Box, MyJohnDeere software, to specialized capabilities for plant counting, roof inspection, 3D printing and more. 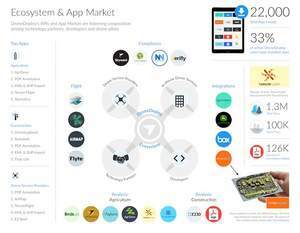 The DroneDeploy App Market is also driving a brand new wave of mobile and IoT app innovation, by enabling third-party developers to monetize and distribute custom-created drone apps across the largest commercial drone data platform. "2017 will be the biggest year for the commercial drone industry to data," said Winn. "We can expect to see a dramatic shift in operations as larger companies invest in drone technology and the drone ecosystem blossoms with the introduction of key new hardware and software partners." To learn more about the Commercial Drone Industry Trends Report, visit the DroneDeploy blog at https://blog.dronedeploy.com. DroneDeploy is the leading cloud software platform for commercial drones. Trusted by users in more than 160 countries across a variety of industries including agriculture, construction, mining and insurance, DroneDeploy is transforming how businesses collect, manage and interpret drone data to improve workflows. Scalable image processing, data storage and sharing in real-time form the backbone of the DroneDeploy platform, while user-friendly applications make it intuitive to fly and capture drone data, view and analyze maps on any device. The robust DroneDeploy platform enables users to leverage best-in-class apps through the drone industry's largest App Market, and to leverage open APIs to build custom tools and integrations. To learn more visit www.dronedeploy.com and join the conversation on Twitter @DroneDeploy. 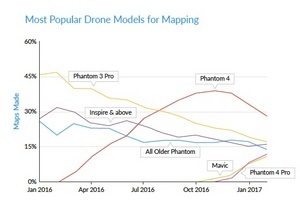 DroneDeploy's analysis highlights the most popular DJI drone models used for mapping over time. A look at the top five industries leading the way in commercial drone adoption. DroneDeploy's App Market helps foster a cooperative ecosystem of innovation in the commercial drone industry.